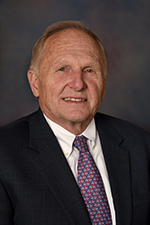 Don Dixon was first elected to the Board of Commissioners in 1982. In 2007, he was appointed to replace retiring Commissioner Mike Fox. Over the years, Don has served on the Fairfield Township Board of Trustees, the Butler County Planning Department, the Transportation Improvement District and many other organizations. The Dixons are lifelong residents of Butler County and have been active in both the private and public sectors. Don resides in Fairfield Township.